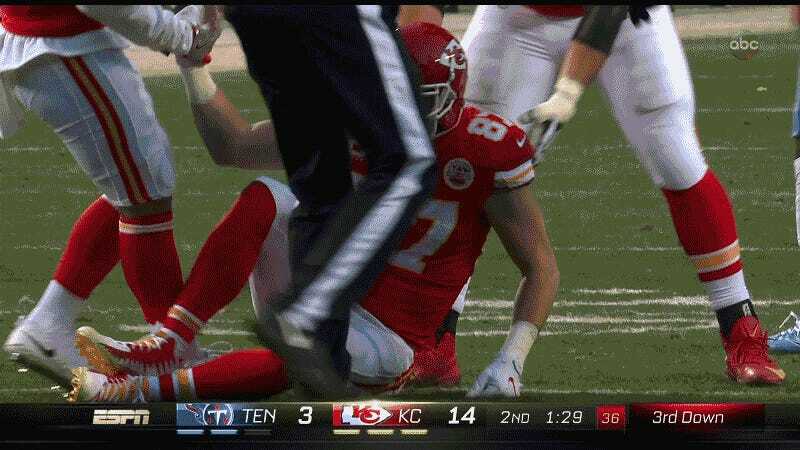 A helmet-to-helmet hit left Travis Kelce dazed and knocked the All-Pro tight end out of the Chiefs’ wild-card blowout against the Tennessee Titans. Kelce’s hit, delivered by Johnathan Cyprien, was not flagged as under the NFL’s rules, players are not subject to targeting once the receiver becomes a ball carrier. Kelce appeared to possibly fumble the ball on the play, but it was not reviewed. We’ll update this post as Kelce’s condition becomes known. Former NFL Lineman Ryan Miller Details The Effects Of His Concussions: "All I Wanted To Do Was Die"